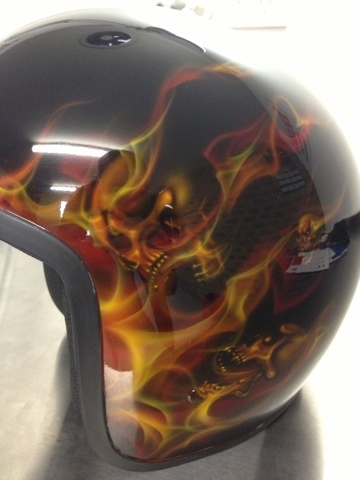 A couple of pictures to show you our latest helmet with real fire and skulls engulfed within the flames. 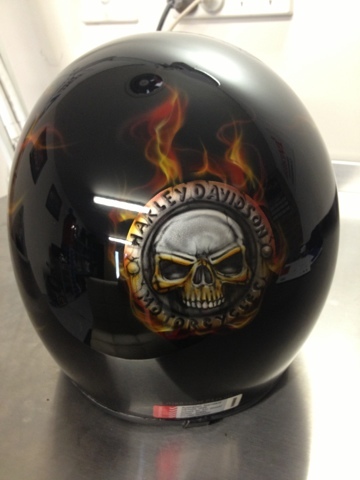 The helmet also has a custom Willy G style skull HD logo on the rear also burning with flames. 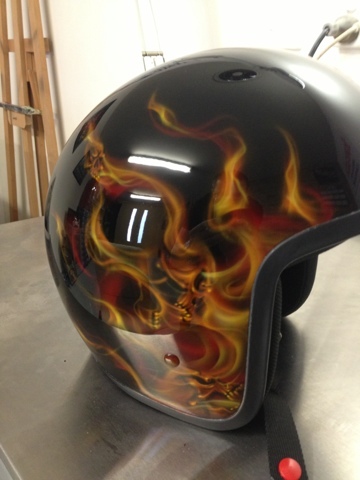 This effect of combining real fire and skulls is really popular and a fantastic way to customize your Harley, helmet, Car, hotrod etc...it can be completed in a variety of colours and every design is unique as the artwork is completed freehand using some specially designed templates. It has been a flat out year for us and we would like to thank all of our customers for their on going support, and continually challenging us with new and exciting projects. We would also like to thank everyone who supports our various online social networking platforms, we look forward to bringing you many more new and exciting info, tips and tricks and of course artwork. We would like to wish each and every one of you an your families a very Merry Christmas and a safe and Happy New Year and we look forward to what 2013 has in store for Airbrush Asylum. 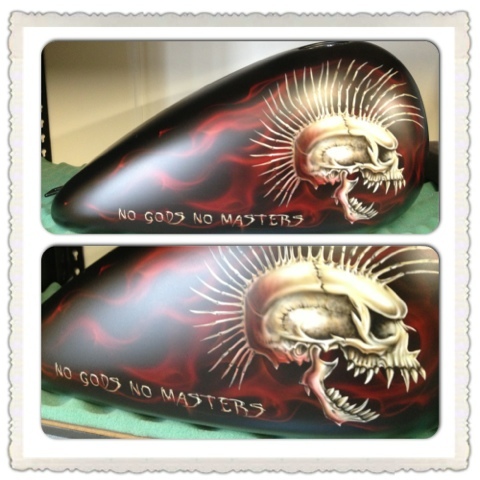 The following pix are one of our latest creations. 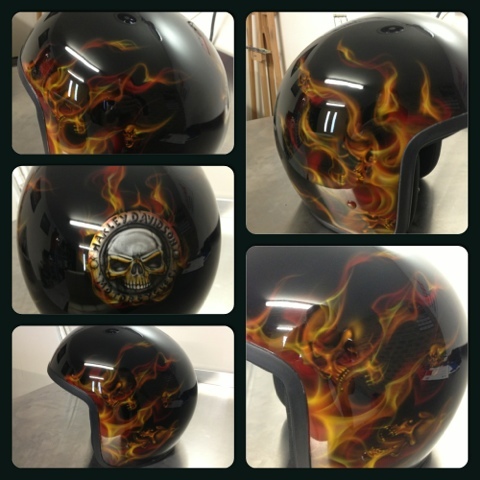 The skull originally from the Exploited album cover, has been slightly modified and set above a flame background with lettering as requested by the customer. 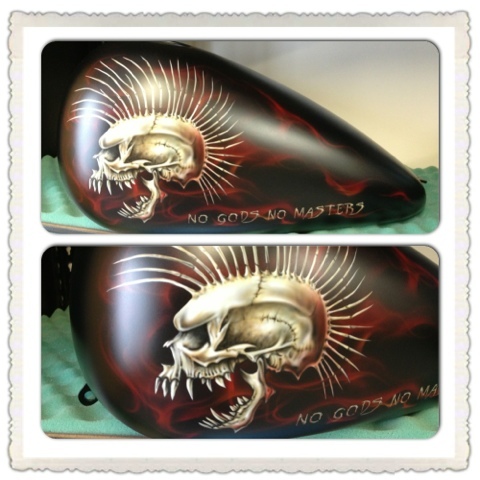 This particular tank was cleared using Matt clear to keep with the entire 'Old Skool' theme of the Harley.